With plenty of hot weather ahead of us I'm thankfully not too late in getting this pattern out! 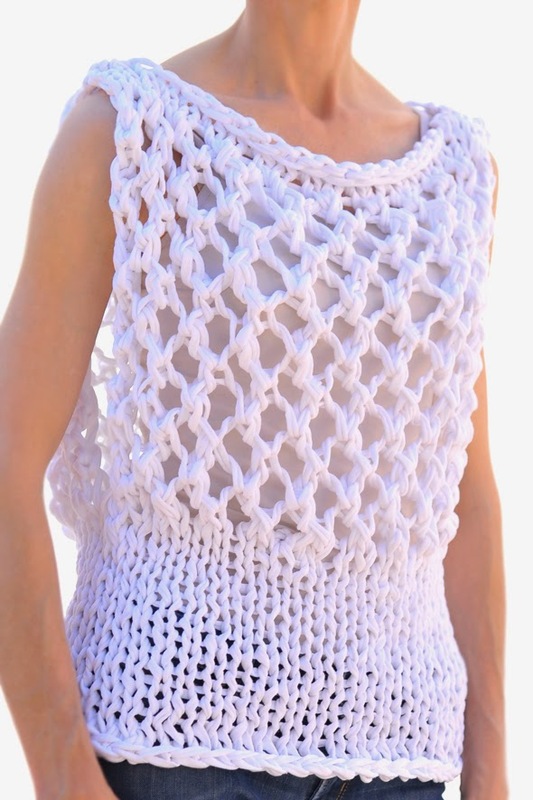 Made with a chunky T-shirt yarn "Tee Cakes" by HiKoo and #19US or 15mm it works up super quick. 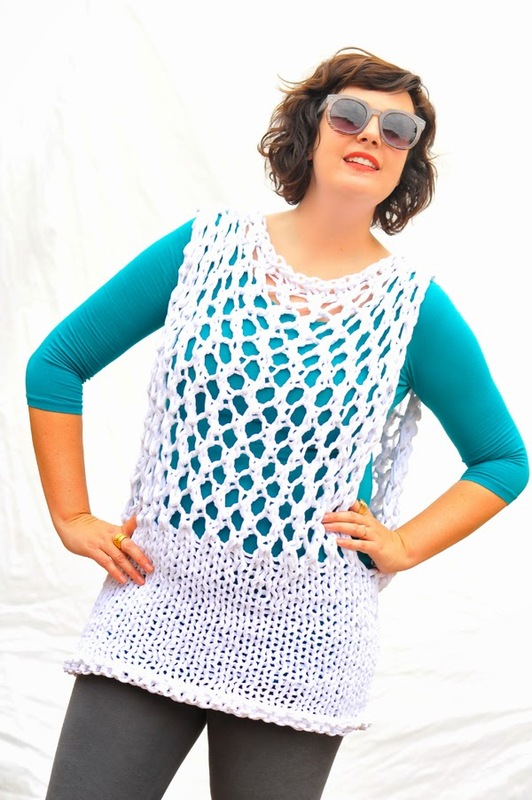 The openwork section, a wide neck and generous side openings make this a perfect summer “T” and I would rate this for at least the advanced beginner because of the openwork section and how the bottom section is worked in the round. Here's a little sneak peak at a design I just completed for The BagSmith that will be showing the beginning of August at Stitches Midwest... kits will be available at that time as well. 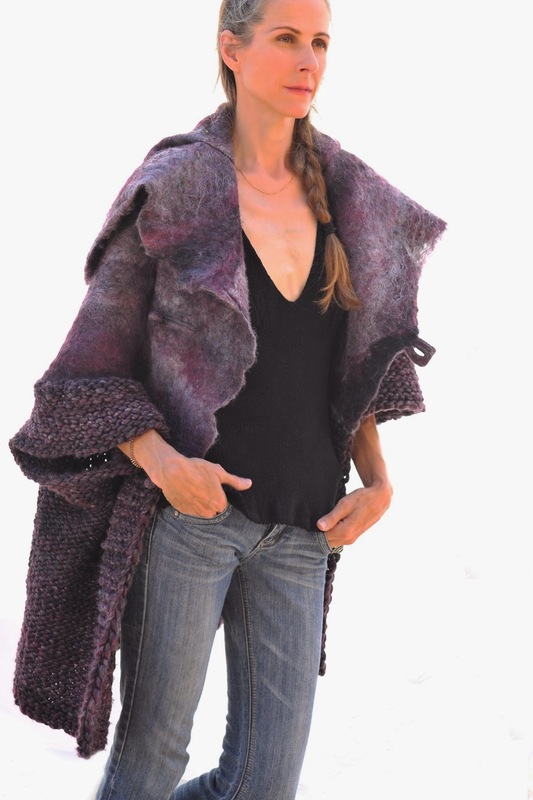 The coat is made using a piece of merino/silk felt fabric (top section) with a yarn that was spun from the same fiber for the bottom section. It was nice to mix it up from the usual by incorporating the felt and since the felt makes up a large part of the piece the knitting (on a #17US, 13mm) works up in no time. Super toasty, this will be a great coat for the coming colder months. It's in the beginning stages, but from now going forward I will be posting new designs there. I come from a family of sewers & knitters. My mom was an amazing artist who taught me valuable lessons in technique, craftsmanship and style. Most of my designs are worked from the top down and seamless with as little finishing possible. I like to include challenging techniques to keep it interesting but aesthetically like them clean and simple. © knit1la.com . Awesome Inc. theme. Powered by Blogger.